Hunters may select individuals to harvest based on various traits. Wildlife managers need to be cognizant of these preferences so that they can mitigate undesirable consequences of selectivity, where warranted. American black bears (Ursus americanus) vary widely in coat colour, yet there is no information on hunter selectivity for particular colourmorphs, even though such selection may occur. To test the hypothesis that hunters select non-black colourmorph black bears, I used a database of black bears killed by hunting and other sources of mortality in Yukon, Canada. I compared the percentage of black and non-black colourmorph bears hunted (n = 1664) to those killed by other causes (n = 655). I found no evidence of hunters selecting non-black colourmorph black bears disproportionate to their availability, contrary to predictions by wildlife managers. 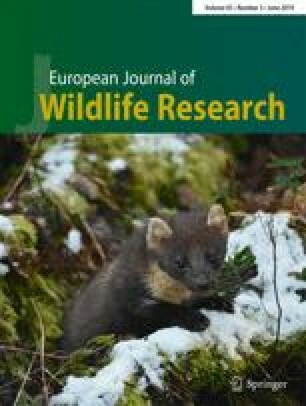 While some hunters in Yukon may prefer to harvest a non-black colourmorph black bear, several factors (multiple motivations for hunting, shooting the first animal encountered, selection for other traits [e.g., body size], or less willingness to shoot a brown bear [Ursus arctos]), or a combination thereof, may result in colourmorphs being harvested in proportion to availability. I thank the many conservation officers, biologists, and front desk staff of the Yukon Department of Environment that contributed to, as well as the data managers that maintained, the database that allowed these analyses, particularly Tena Fox. This manuscript benefited from early discussions with Ramona Maraj and comments by anonymous reviewers.